As previously reported, guitarist Eddie Van Halen's 15-year-old son Wolfgang has stepped in for original bassist Michael Anthony in the new incarnation of the group, which also features drummer Alex Van Halen. Van Halen last toured in 2004 with vocalist Sammy Hagar, grossing nearly $40 million, according to Billboard Boxscore. Hagar refused to collaborate further with Eddie and Alex Van Halen after the tour's completion ("I don't get along with Eddie anymore, and that's all there is to it," he told Billboard.com in August 2005), although he has consistently played live with Anthony in recent years. The warring factions may wind up meeting in public in March when Van Halen is inducted into the Rock and Roll Hall of Fame. "I see it absolutely as an inevitability," Roth told Billboard.com last May of a potential reunion with his ex-bandmates. "To me, it's not rocket surgery. It's very simple to put together. And as far as hurt feelings and water under the dam, like what's-her-name says to what's-her-name at the end of the movie 'Chicago' -- 'So what? It's showbiz!' So I definitely see it happening." Hagar recently told Billboard.com he was concerned Eddie Van Halen was asking too much of his son to have him join the band and promptly perform in front of thousands of people every night. "That's a lot of pressure for Wolfie. Just 'cause he's Eddie's son doesn't mean he can go out and play in arenas and perform and entertain an audience for two hours," he said. "I would love to see Eddie and Alex get behind Wolfie, with a kid of his age singing, and produce the record for him and help him launch a career. I'd rather see it go that way than come out and say 'Wolfie's the bass player in Van Halen and maybe singing, too.' 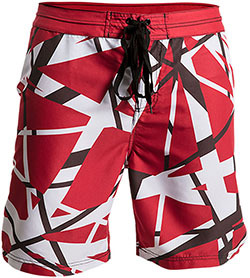 Van Halen's got way too much history to have that put on him." "And as far as hurt feelings and water under the dam..."
Water under the dam? Think about it. They probably won't have too. Eddie and Dave will kill each other after 20 dates. GEEZ...i can't believe i actually FELL for that! Roth said on his radio show that it would be a Summer tour with not that many dates just to do it and get it out of the way. It's not the second coming of Van Halen as much as it is a chance to put a big show on the road for a good cash infusion and some chicken soup for the Van Halen soul. I'm going as long as Ed and Dave are there. I knew you were telling the truth Venom. I have just been informed that the announcement is expected to come by the end of the week. It will likely be just a press release. Don't rule out a video announcement on the band's official website when it makes its return shortly. Everybody is happy and more importantly, they are all healthy.